Saw blade will be coated with a layer of grease before using it which will help the joints of saw blade active freely and protect it from rusting. The saw tooth is very sharp, please be cautious to use it. Gear hand chainsaw are made of ferromanganese steel alloy,greatly enhanced corrosion resistant and durable. It's great outdoor survival tool, perfect for hiking, camping, exploration,travel,expedition and all other outdoor sports.It is also a good tool for home and garden use. Chainsaw with sharp gear so that it can be used to cut branches, wood,plastic,soft metal,and so on.Each saw blades is designed tighten,cut wood quickly and easily without too much effort. 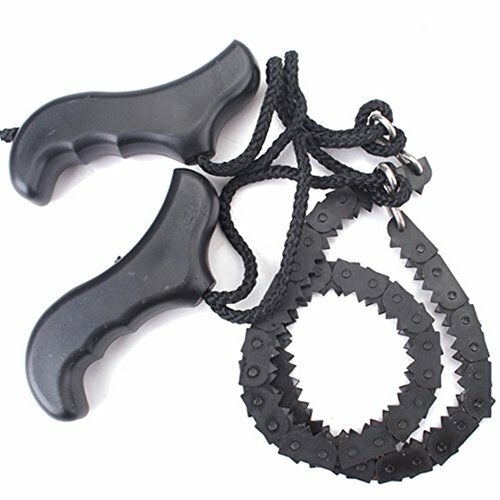 The hand chain saw is lightweight,small size,can easily fits into your pocket and occupy in tight space. The plastic handle makes the camping chainsaw with better grip feeling, more comfort and higher efficiency in using,and it is simple for anyone to use.